A picture of what the greenseeker data looks like once it is loaded into ArcMap. Each line accounts for the L,N, and R strips. Once the data is collected, it is time to make use of it. The NDVI data from the greenseeker is put into ArcMap. 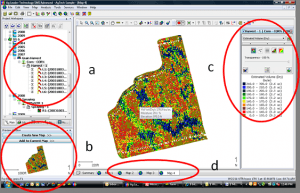 ArcMap is a software program that allows for the spatial analysis of relationships. It is extremely useful not in gathering information but in manipulating it in order for conclusions to be made. 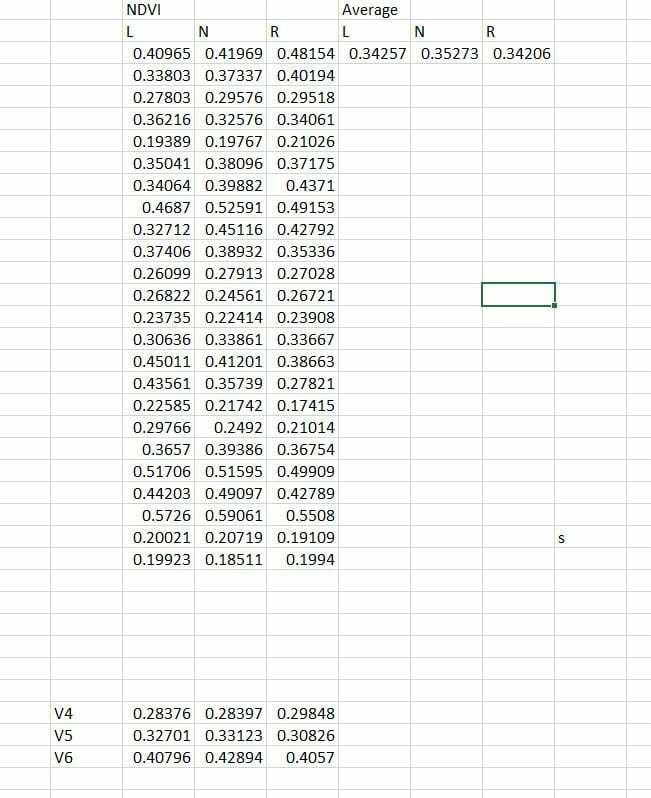 First, the data is cleaned and trimmed so there are no outlying values present. Points are added to make the the polygons that will create the final data set. Once the polygons are made around each strip, the join function will be used. The join tool uses one data set’s attributes to and fixes that to another’s location. Each strip gets its one attributes. Then from that the difference in NDVI can be determined between each strip. A picture of the data set from the joined data sets. It may not look like much, but it holds lots of important information. This is done for each and every field. A report is made of all the fields. 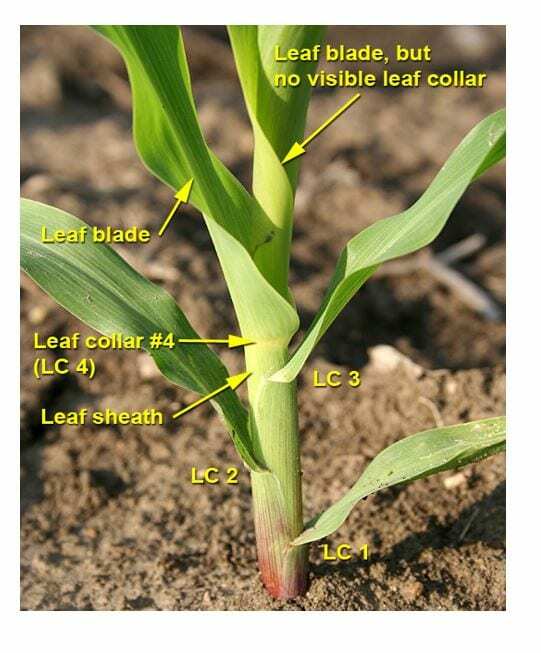 The increased NDVI in the Nrich strip supports that the corn is healthiest where it has sufficient nutrients. It is also worth noting that the average NDVI for all fields that were recorded at V6 is higher than the other fields at V5 and V4. This type of approach can give us insight on what areas of the field are the healthiest in order to manage accordingly. 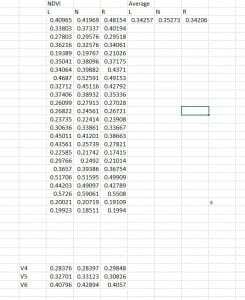 A picture of the final report of the NDVI for all fields including the average, and the average according to the stage when the data was collected. A picture of myself taking soil samples in a strip. 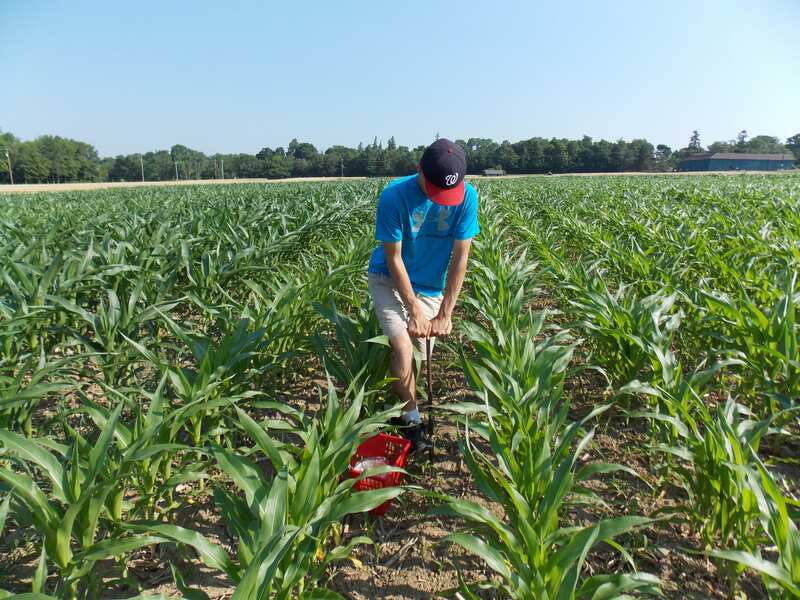 Just before the side-dress nitrogen fertilizer is applied to the corn fields, it is time to do a lot of field work. To begin, the PSNT (pre-side dress nitrogen test) is taken. 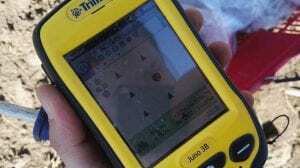 They are soil samples taken in relation to the GPS points in the field. It requires 8 cores of soil from 12 inches deep. Along with that is sample of 8 cores at 8 inches deep to measure the concentration of other macro nutrients like potassium and phosphorous. Each field has a L, R, and an N strip. The N strip is where the extra fertilizer is added to. Depending n the size of the field, the number of points vary. In some fields there may be up to 19. That is 114 soil samples for one field! Another job is to walk the greenseeker. 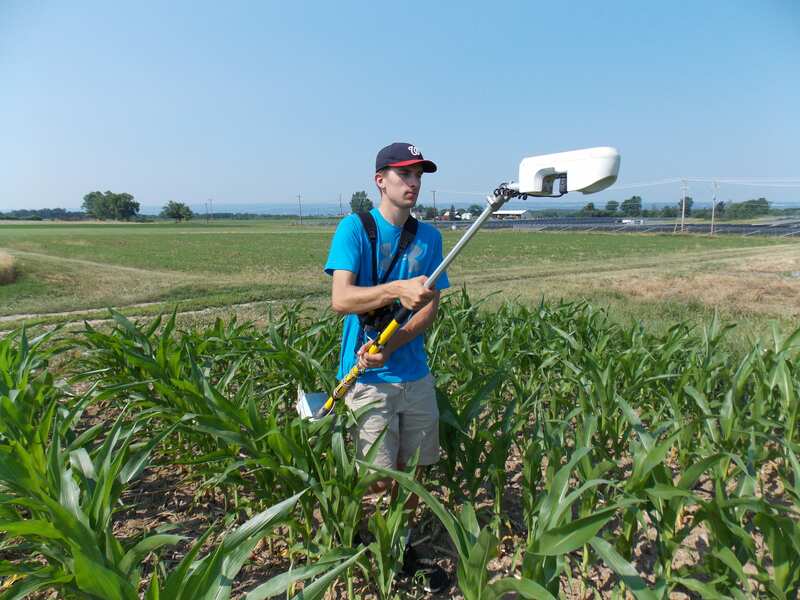 The greenseeker is a device that measures Normal Digital Vegetative Index (NDVI). It is used to quantify vegetation by measuring the difference between near-infrared (which vegetation strongly reflects) and red light (which vegetation absorbs). 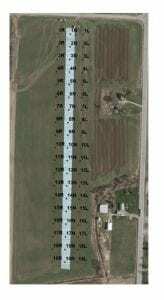 This is one way to estimate the potential yield. The formula for NDVI. NIR stands for the near-infrared light reflected and Red is the amount red light absorbed. Covering each strip does take a long time since there is only one greenseeker. It’s especially grueling during the heat and humidity of summer while keeping at a constant speed at 3 feet above the canopy. A picture of myself walking the greenseeker at Aurora. Drones flying can be very challenging. 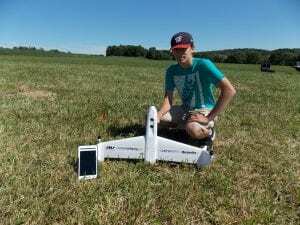 Weather and surrounding objects play a large role in the success of a drone flight for a particular field. 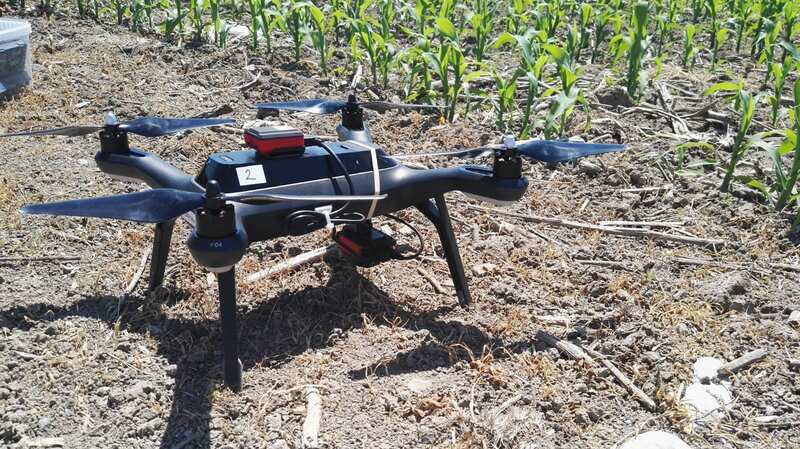 The drone is responsible for taking multi spectral satellite images that measures the amount of reflected light by the plants from the sun. A close view of the drone used to take light images. 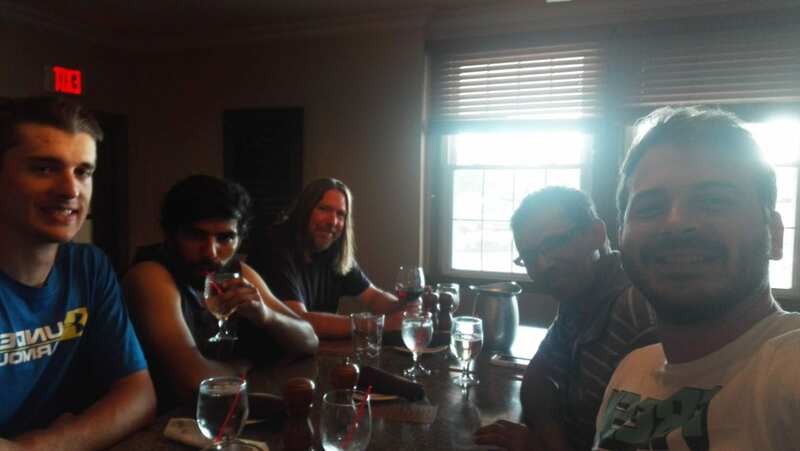 It has been an insane period of time traveling across the New York from Peru, to Hudson Falls, and to Perry. 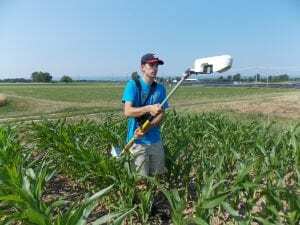 In total 30 fields and 5 research plots were soil sampled, had greenseeker data, and drone images taken. A total of 3147 soil samples! The next part of the project is processing the data in order to make sense of it all. Corn is an extremely important crop to agriculture in New York State and nitrogen is the most limiting nutrient. 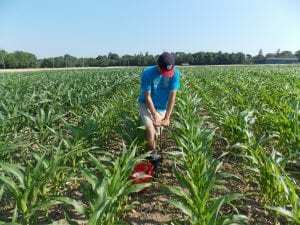 The work being done my supervisor in the Nutrient Management Spear Program is to study how added nitrogen affects corn yields. The studies are called Nrich strip trials. 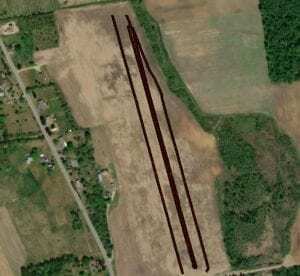 In order to begin the study, fields with at least three years of yield data are selected, preferably large ones since they typically have more variability. The yield data is arranged to represent 4 different quadrants in the field. A week after planting, a strip spanning the length of the field is laid out. It is where the extra nitrogen fertilizer is applied at side dress time, usually 75 lbs. more per acre. The strips are about two chopper or combine passes wide in order to draw accurate conclusions. 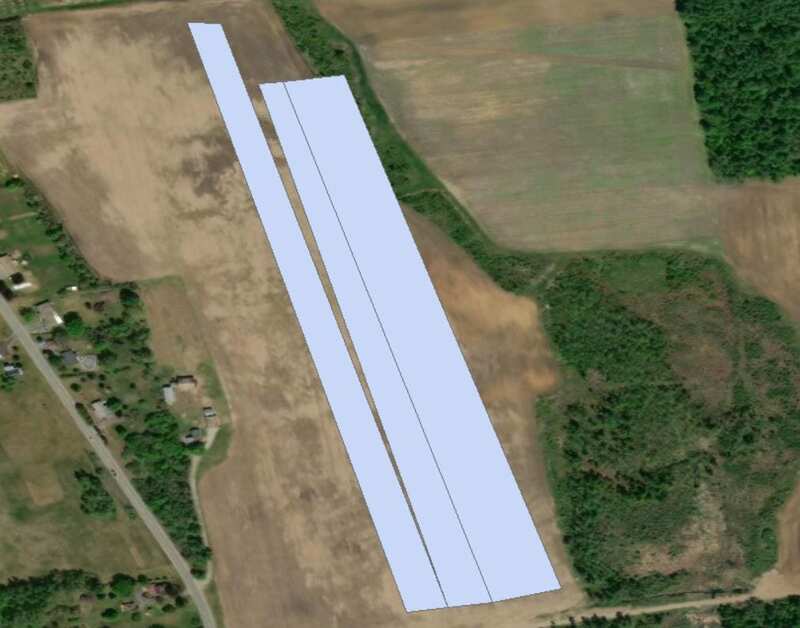 A quadrant map of two fields selected for this project. The gray marks indicate the area for extra nitrogen fertilizer. Once the trial is set up, GPS points are taken in the field. 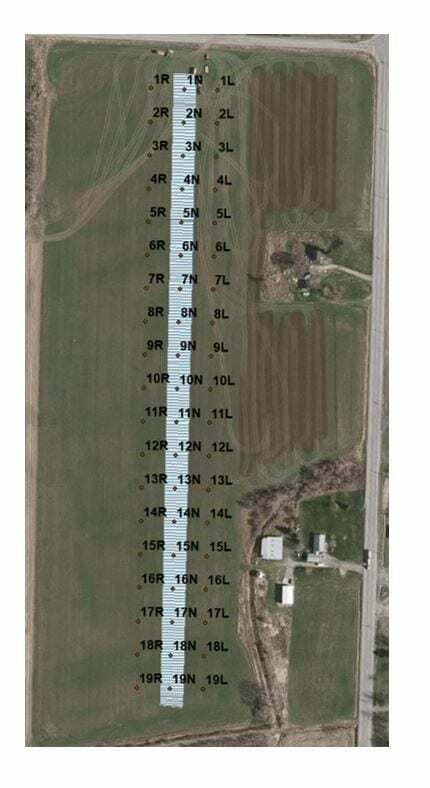 The points are the locations from where the pre-side dress nitrogen test (PSNT) will be taken. A PSNT measures the amount of nitrate (NO3-) in the soil. Nitrate is an inorganic form of nitrogen that plants most readily take up. Along with the PSNT, drone images, and green seeker data is taken when there are six collard leaves on the plants, otherwise known as V6 stage. That is where I will begin my next post. GPS points taken from the field are downloaded into Arc Map to create a map like this. The white rectangle represents the Nrich strip. 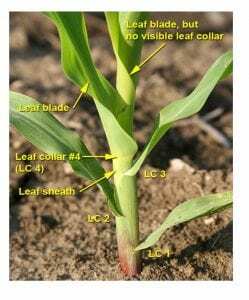 This is a diagram explaining what collard leaves on a corn plant look like.